Tags: corsets, health, the body, truth? As my grandma says, you have to suffer for beauty. Be careful – you don’t want to do yourself an injury just to look good. I knew what it looked like, but it’s still shocking to see. I think your grandma is wrong. I have been wearing a corset for 4 years now. I love the look and the feel of tight lacing. But I am not going to the extreme as going for a 19in waistline. Some women went for that extreme, but not all. 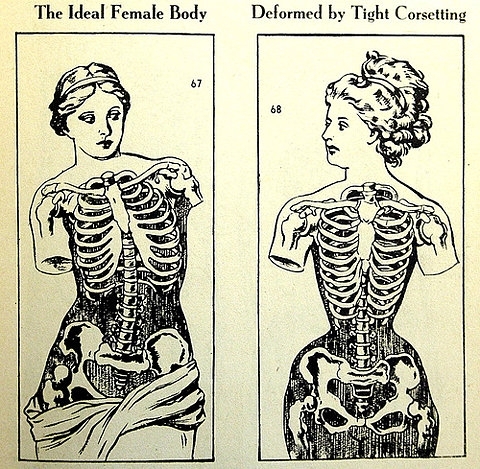 They started at an early age wearing a corset and forming the body gradually without pain. Our bodies go thought all kinds of changing, stretching, rearranging thought out our life time, especially during child birth. It is not deforming the body. I feel if it crafting the body to your needs. The sensation of being tightly laced in well-fitting corsets is frankly superb and delightful. The most important thing is to impose the change in shape gradually. The beauty of a slender waist is undeniable. All things in moderation. Thanks for stopping by Lillian! In the past, I’ve asked a few costumers about wearing corsets, and many of them have stated that if the corset feels uncomfortable, you’re wearing it incorrectly. I love the Edwardian era fashions so much. It was a time of the supremacy of feminine elegance. I can understand why Beauty became a religion for many women. That illustration is actually from the 18th century, around 1790 I think (you can see it’s not an Edwardian type corset.) I always have doubted its veracity — unless someone tightlaced themselves 24 hours a day from a very young age so that their body grew permanently deformed such that it would hold the shape of a corset even without one on, there’s no way they could have really known what was going on internally. There were no x-rays in the 18th century and even with very severe and constant tightlacing, your stomach falls back to normal within an hour or so of removing the corset, so it couldn’t be from an autopsy.